Since 1899, Cape Cod Shipbuilding Co. has been manufacturing, maintaining and providing storage for fine quality, pleasure sailboats. As one of the original pioneers of fiberglass boat construction, we employ highly skilled craftsmen who implement our proven and uniquely developed manufacturing process. Our complete line of traditional designs are exquisitely finished and trimmed in brightwork that is simply stunning. With over a century’ worth of know-how, our family business will deliver not only the boat, but the experience of a lifetime. 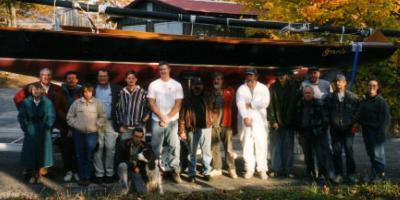 Cape Cod built boats become treasured heirlooms; sailed by families for generations. We look forward to welcoming you to our family. Cape Cod Shipbuilding featured on Chronicle. Article by Naomi Pappas of the Standard Times about our 100th Anniversary Celebration.
" Smooth Sailing with Kennedys"
Article by Leedia Macomber of the Wareham Courier about building three Herreshoff H-12's for the Kennedy family. "Shipbuilder completes 900th Bull's Eye"
Article in Standard Times about the completion of our 900th Bull's Eye. "Possessed, A Sailboat With Lines An Architect Can Love"
Article by Brian Tetrault of the Standard Times about business done the old fashioned way.